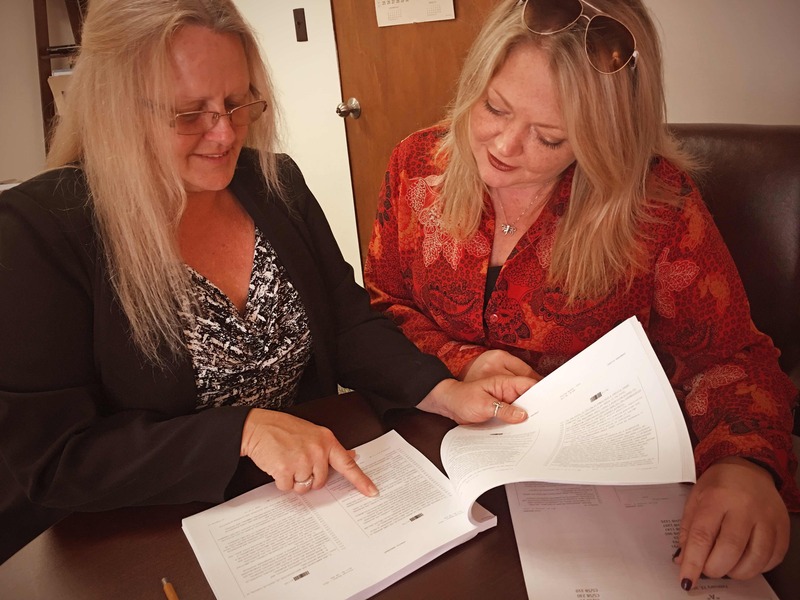 Theresa King (left) and office manager Helen Parker (right) going over legislation affecting trades workers during the 2016 session. 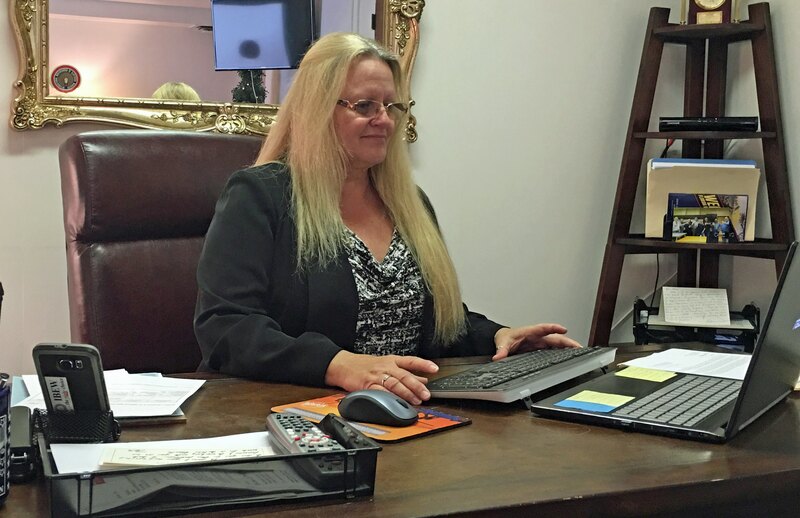 In September of 2015, Theresa King was the first woman ever to be elected as President of the Florida Building and Construction Trades. In our monthly Labor spotlight, Field Representative for the Volusia-Flagler AFL-CIO Yennifer Mateo interviews Theresa who reflects on her work in the trades, the difficulties she faced as a woman in a strongly male dominated field and the importance of breaking down gender barriers in all professions. Yennifer Mateo – Hello Theresa and thank you for taking time this afternoon to speak with me and for the opportunity to learn about your inspiring role as first woman President of the Florida Building and Construction Trades Council. Theresa King – Well thank you, this is quite an honor. Yennifer Mateo –To many union women in the state you are seen as a sort of super hero for your accomplishments, tell us how you reached this point. Where are you from and how did you first get involved with Organized Labor? Theresa King – Well, I’m originally from Georgia and in September of 1987, I met my husband while he was working out of a local International Brotherhood of Electrical Workers hall as a Journeyman Wireman. When we first met, I had no knowledge of the trades. I had just turned 26, and in the process of getting to know him, I learned a lot about his passion for his local union and the virtues that the IBEW stood for. My husband and I traveled the first four years we were together. He worked in his trade and I found any job I could get. We were together for 12 years before looking at him one day and deciding that I wanted to create a union future for myself. I thought to myself “Hey, why can’t I get in the trade?” When I was struggling really hard about where I was going with my career my husband was a driving force in encouraging me to join the union, and here I am! Yennifer Mateo -Did you have a leader or mentor that guided and/or encouraged your personal development within your local? Theresa King – As I mentioned, the one who guided me toward joining my local union was my husband. You have to understand that there was a mentality back in the day that women didn’t belong in the trades. My husband wasn’t one of those people. He watched several women come through the local apprenticeship program and pushed me to realize “If they could do it, Theresa so could you.” I should mention that when you are a good worker, you have a lot of mentors. A couple of local leaders really took me under their wing and helped me to grow in the trades. Working hard and having those influential people in my life helped me get elected as Recording Secretary of my local. Yennifer Mateo -At what point in your career did you decide to pursue a leadership position? What lead to you making the decision to run for President of the FL Building Trades? Theresa King – Well, that’s a unique story itself. While I was an apprentice and then a Journeyman, I started getting involved with the Central Labor Council in my area. I did canvass walks, phone banking, just anything that I could to make a difference. My local union would send me to Tallahassee to lobby during legislative session and they would have us lobbying on Building Trades issues. Every time someone would ask me to do something, either my local or with organizing, I did so passionately. To be an effective leader you must take on all kinds of roles and I never hesitated to work on what I could in the fight. If you’re a good tradesman, man or woman, you do what you’re asked to do with the same passion as when you carry your tool bags. I’ve carried that mentality throughout my career as a tradesman and it was seen by others. When nominations for Florida Building Trades President began, I did not give it a second thought, but local leaders reached out and encouraged me to run. It was truly a shock. I doubted myself asking, “With all the Building Trades activists you know in the state of Florida, why me?” I was told that my resolve, dedication to my work for my local union, and the passion I brought to my trade showed leaders from across the state that my heart was truly with the future of the Building Trades. Yennifer Mateo -As a woman, did you face any difficulties or hardships because of your gender? Theresa King – Absolutely. Working in a very male dominated profession, the same gender stereotypes of women are sadly too often echoed. I would hear that women are too “emotional” to negotiate or not “strong” enough to work with tools. Even when I was a general foreman and estimating projects it was difficult to get contractors to actually see that I was capable of so much more. It’s like they are afraid to step out and maybe admit that a woman can do as good, if not a better job, than a man can do in that position. You do face difficulties with that. When you do face those difficulties, the only thing that you can do is let your work speak for itself. My work speaks louder than other peoples’ opinions do. Yennifer Mateo-What are the issues facing the Building Trades Council now in the FL Legislature? Theresa King – Currently? Well, this 2016 Legislative Session did have a bill that would have been very detrimental to all local trade unions and the local municipalities who are trying to set up livable wages in their own local communities and hire a skilled workforce. This bill would have restricted cities and counties here in Florida from setting up things like living wage ordinances and local hiring preferences, anything that the State Legislators saw as affecting local workers’ rights. This particular year we were able to get that bill, one of the strongest anti-worker bills in the State of Florida, killed in its first Senate Committee. I’m honored to have such an amazing victory during my first year as President because many of the important lobbying and relationships built with legislators that led to this victory were built long before I stepped into this role. We do have another bill right now that is a 90-page “train wreck” of a piece of legislation that would make exemptions for apartment complexes to be able to hire maintenance companies to do all of their maintenance work. In turn, they want to be able to say they will offer an unacceptably short course for the employees to take and that would somehow make them qualified. This is a dangerous proposal that affects the safety of both workers and occupants of apartment complexes. Yennifer Mateo -In the upcoming elections, how do you see the Florida Building and Construction Trades Council playing a role? Theresa King – Well, in the upcoming elections I have been asked by our Florida AFL-CIO President Mike Williams, now that I’m President of the Building Trades, to sit on the COPE (Committee On Political Education) Committee for the FL AFL-CIO. So my involvement, representing all the trade crafts, will be sitting in on the screening process for our upcoming endorsement convention in June and making sure that those who we endorse have labor and the trades in their best interests. If we agree to endorse folks and then find out they are fighting against working families in Florida, then we will hold them accountable. I am excited that this year will be my first as a member of the COPE Committee and I look forward to the education I get from that and being able to help endorse people who stand up for Florida’s working families. You know I only laid down my tools for four days before prior to coming to Tallahassee to take this President position? So working with my tools is still fresh in my mind and I know what a trades worker will be looking for when it comes to endorsing a politician. Yennifer Mateo -Thanks for this opportunity, Theresa! Any message you’d like to leave with our readers? Theresa King – I know that as the first woman President of the Florida Building Trades, I’m going to bring a fresh new perspective, but I also hope that my role can be an inspiration to women working in the trades. Many women struggle to know if they can make a difference in their jobs and in their communities and I hope I can show them that they can. I want women to know that with hard work and dedication they can take the trades anywhere they want to. I feel like I’ve been given an opportunity of a lifetime and I want women in the trades to know that they can also have that same opportunity.